One of the best parts about RPG is dressing up your character and powering up or upgrading with potions, weapons, and the like. If you’ve played this type of game, you know exactly what I’m talking about. You spend more time obsessing over winning and purchasing items than actual play. Can you get the Zombie Instagib or should you save up for the Vagabond lessons? Namazu Studios’ RPG offers a great selection of hundreds of items you can purchase to deck out your avatar so you look good for online, one-to-one battles with other players. You’ll feel like you’ve stumbled into this awesome free treasure that no one knows about just yet. And that’s exactly part of the problem. Not enough people know about it so your excitement will soon deflate. After you download the game, and create your special character, you’ll go to the Duel Lobby Menu and enable buttons that allow you to receive challenges from other players: choose from off, unranked, or ranked. After awhile, you’ll realize that most people aren’t online, and those that are will wipe the floor with your character. So if you’re just starting off, you’ll try to find an Unranked Duel and see that only one or two people are on. And most will be sleepwalking (off). Thank goodness you’ll be able to duel the sleepwalkers if no one is on, but you’ll only receive half your usual points and credits. That’s better than none, right? So after entering the lobby and finding someone suitable to challenge, you select them and give them a little glove slap, old-old-old school style. Your actions will be limited to attack, reckless attack, and special. The attack option will let you deal your attack power on your opponent. Reckless attack will let you deal your attack power and fighting spirit, but you risk losing HP points if your opponent defends. Defend reduces the amount of damage to your HP points. 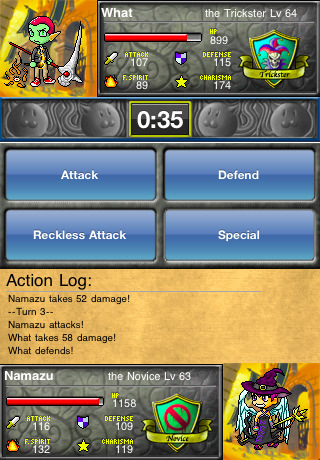 Finally, special allows you to unleash special attacks or defenses that you’ve accumulated or purchased. iDuel Online is a fantastic role playing game except it falls short on the sheer number of players online. Hopefully that will change in the next year because it has great potential. Unlike other RPGs, not only will your character’s attack power count but you’ll get points for looking good in this game. So yes, you’ll get awarded consolation points for sporting sparkly gloves and kitten heels. You can even buy potions of specialness with your real money to win Spectral Credit. Controls are also easy to use and make gameplay a cinch. There’s also online leaderboards so you can see who’s been strategizing well (or who spent too much of their free time online). The audio is a little weird and some of it reminds me of kiddie xylophones meets the Bahamas. It’s not annoying and the loop is long enough so that it won’t become grating. If you don’t like it, you can always adjust or disable sound effects and music. You’ll also be able to change the background from the game’s limited offering. There’s even integration with Twitter if you want to tweet your victories and get your friends to join in on the fun. The graphics are also fun to look at. The characters are anime-styled with big heads, small bodies, and huge sparkly eyes. The game still has some bugs to be worked out. While I was playing with some sleepwalkers, the game would often just shut down. There’s no autosave, no nothing. And I have no idea why the game simply shut. You might get pretty upset too if a battle is going well for you. Developers should definitely work on that bug. It would also be great if users could play their own music without worrying about the game shutting down. And more backgrounds would be much appreciated. Developers could create seasonal backgrounds or let users customize their own. I’d also like to see developers add an option that allowed players to eliminate the ad banner by purchasing a credit. Developers could even add super special items or upgrades that are available for purchase with real money. Finally, a forum or chat feature would also be a great addition so players can hurl insults at each other during play to break up the monotony. Overall, this is a great game that is FREE. If you’re a fan of battle PRG and have an iPhone or iPod Touch with wifi, 3G, or Edge Network connection, give iDuel Online a try. And if you do like it, get your friends to join so we can all get more points and create bigger weapon wardrobes! See you online, and don’t forget to give me a little glove slap in the face! AppSafari review of iDuel Online was written by Linda Ta on April 15th, 2010 and categorized under App Store, Asia, Free, Fun, Games, Multiplayer, RPG. Page viewed 3539 times, 1 so far today. Need help on using these apps? Please read the Help Page.